~Available as an A6 postcard, please see order form. Original available. Oil on Canvas framed in gold approx A2 sized £425. 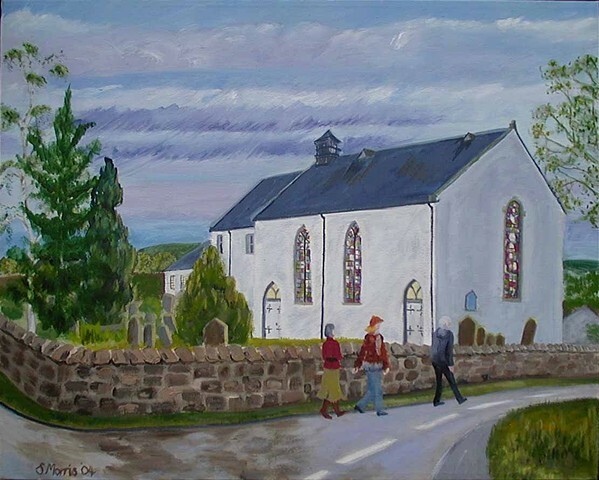 A typical Scottish Village Church with a few people on their way to evensong with the daylight fading in the West (East Window towards the Viewer) and even bands of clouds over the Ochils. After painting this canvas,our Minister died unexpectedly, and a few people said to me that they thought the leading figure in the parade of figures was rather like him.